This Year of Jubilee has been rich in blessings for our Rosary Community. With the Golden Jubilee of our Monastery and the Solemn Profession of our Sr. M. Jacinta Therese we praise and thank God for the gift of the holy Year of the Eucharist. On 10th June, Feast of Corpus Christi, the Holy Father announced that from October 2004- October 2005 the Church would celebrate a year dedicated to the Holy Eucharist, source and summit of the life of the Church. We shall offer our Christmas Novena of Masses and prayers for all of your intentions. At this Christmas, may JESUS grant you, through MARY, His richest graces of holiness and peace. On 16 June, our Community joyfully celebrated the 50th anniversary of the Foundation of our Monastery. The Mass of Thanksgiving was celebrated by our Bishop, Dom Serafim along with numerous other priests from Fatima, some of whom have known our Community from the beginning. It was a special joy to reminisce with Sr. Louise Marie, OP and Sr. Mary Diane, OP, both members of the founding Community. On such an occasion we can only render humble and profound thanks and praise to God through the Queen of the Holy Rosary. We also remember with loving gratitude all of our Sisters who have gone before us to the Throne of Grace. Without each one of them this Jubilee would not be possible. We gladly share with all of our Friends of Fatima a brief history of our Fatima Foundation. In this way we wish to convey to you and to all those, who have assisted our Rosary Community, our most sincere gratitude and assurance of continued prayers for all your needs, spiritual and material. 50 years a Priest and 25 years a Bishop, as well as the Golden Jubilee of our Parish Priest of Fatima, Fr. Manuel Henriques. “The Dominican Nuns of the Perpetual Rosary, founded by Fr. Damien-Marie Saintourens OP, in Calais, France, went through a life of itinerancy, because of religious persecution in France. The missionary zeal of Fr. 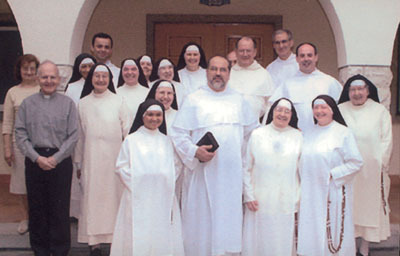 Damien-Marie has been very fruitful and monastic life of contemplative nuns flourished in different parts of the world. The Monasteries of Nuns in Asia, Europe, and America are living witnesses of our contemplative missionary and itinerant life, lived and transmitted by our predecessors. Fifty years are not long, but long enough to taste the goodness of the Lord and experience His mercies. You were founded with the specific aim to base your contemplative life on the mysteries of Christ, in perpetual union with Mary by means of the devotion to the Rosary. The efficacy of your life spent in seeking the presence of the Lord is beyond telling and it produces many apostolic and missionary graces for the world. 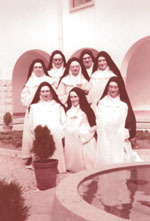 The Dominican Nuns trace their origins to the year 1206 in Prouilhe (France). St. Dominic and Bishop Diego, both Spaniards, established the first Monastery of Nuns in southern France, at that time a stronghold of heretical teachings and practices. 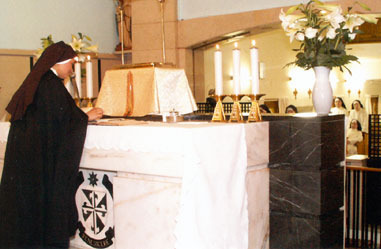 Living in solitude and silence, dedicated to prayer and contemplation of the Divine Word, the Nuns were to support and help make fruitful the holy preaching of the Friars all for the glory of God and the salvation of souls. After preaching – in particular the Holy Rosary – for nearly twenty years throughout France, Fr. 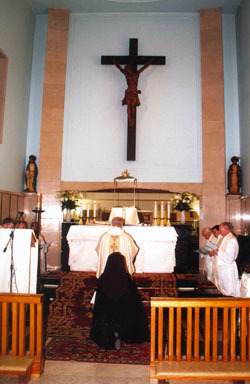 Damien Marie was sent by his Provincial to preach the Lenten services in the Cathedral of New Orleans. 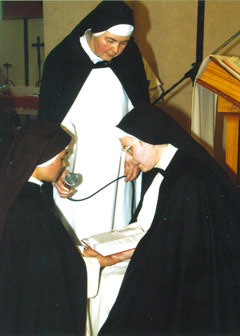 As a missionary to the ‘new world’, Father sought permission to establish the Perpetual Rosary Sisters in the Dominican Vicariate of Canada but Providence allowed this to be denied. He later obtained permission to open a Monastery of Perpetual Rosary Sisters in Union City, New Jersey in 1891. This was followed in 1900, when the Camden, NJ foundation was made. It was here that Fr. Saintourens spent the last twenty years of his life. Soon after his death, 26 September 1920, Mother Mary Louis Bertrand became Prioress of Camden Monastery and later established the Perpetual Rosary Sisters in Syracuse, NY (1925), Rome, Italy (1930) and Glasgow, Scotland (1948). The first Dominicans arrived in Portugal in 1217. In 1834 Religious Orders in Portugal were suppressed. In 1894 the Fathers began to re-establish themselves only to be expelled once again in 1910. After some years the Portuguese slowly began to restore their houses. 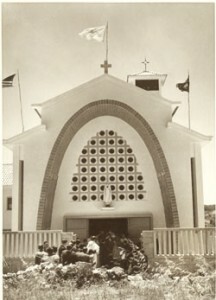 In 1948, at the request of the Master General Fr. Emmanuel Suarez, OP, some religious from the Province of Canada came to assist the Portuguese in the restoration of their Province. Fr. Pius Marie Gaudrault, OP, former Provincial of Canada, was among these religious. Fr. Gaudrault was acquainted with the work of Fr. Damien Marie Saintourens, his love for Our Lady of the Rosary and the foundations of the Sisters he had made. In 1949, as Vicar General of Portugal, he invited Mother Mary Louis Bertrand, to make a foundation of Perpetual Rosary Nuns in Fatima. Fr. 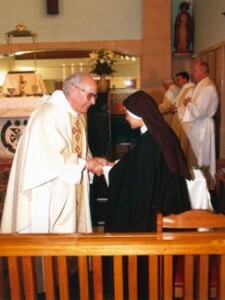 Gaudrault’s desire was to fulfill the request of Our Lady in a perpetual way and to see all the branches of the Dominican Order established in Fatima “all around our beloved Mother, the Queen of the most Holy Rosary.” The mission of the Nuns would be to assist by their prayer and sacrifice the restoration of the Dominican Province of Portugal. Permission was graciously granted by the saintly Dom José, Bishop of Leiria, who had approved the Apparitions of Fatima in 1930 and showed such kindness to young Lucia. Thus to Fr. Gaudrault’s vision, faith and desire, Mother Bertrand joined her own faith, courage and devotion in order to complete what would be her last foundation and the one she would lovingly refer to as her “Benjamin”. But due to Fr. Gaudrault’s poor health, Fr. Louis Marie Sylvain, OP, one of the Canadian Fathers who had also come to assist with the restoration, took in hand the project of our Foundation working very closely with Mother Bertrand on all the details of land purchase, construction etc. Fr. Gaudrault would not live to see the opening of the Monastery. On 28 April 1953, at the age of 63, Father died in the Convento of the Dominican Fathers here in Fatima. On December 22, 1951, Mother Bertrand wrote to the Holy See, requesting that the Holy Father, Pope Pius XII, approve the foundation in Fatima and allow it to be known as Pius XII Mosteiro do Rosário Perpétuo (Pius XII Monastery of the Perpetual Rosary). Pope Pius XII was a Professed Dominican and an ardent believer and preacher of the Holy Rosary. Approval was readily granted on 15 January 1952, in a document from the Holy See signed by Federico Cardinal Tedeschini, Cardinal Protector of the new foundation. The foundation of our Monastery is a most beautiful witness to the designs of Divine Providence and to the fidelity of souls consecrated to God first by Baptism and then by the Evangelical Counsels. We thank God and Our Lady of the Rosary for bringing to fruition the labors of Fr Damien Marie Saintourens, ‘missionary of the Ave’, in Canada, which began in 1886. No labor for God and His Holy Mother is ever without some reward – now and hereafter! On 13th May, Sr. Marie Jacinta Thérèse Rodriguez, OP, pronounced her Solemn Vows in the hands of our Prioress, Mother Maria of the Eucharist. Fr. Miguel Santos, OP, our Provincial presided at Holy Mass with 13 other priests and a multitude of faithful who joined us for this most beautiful occasion.The music was heavenly with the Magnificat sung in Portuguese by a young friend and again in Tagalog, as a Post Communion hymn by the Filipina Sisters who serve here in Fatima. Sister M. Jacinta Thérèse is one of a large family and a native of the Philippines where she was a member of the Dominican Daughters of the Immaculate Mother. Her sister, Maria Socorro, came from her teaching assignment in China to be with us in those days. We are delighted to share this interview with Sister. May Mama Mary – an affectionate expression for our heavenly Mother – continue to inspire and protect all our Friends of Fatima. Sister, you recently pronounced your Solemn Vows in the Order of St. Dominic. What does this mean? This means that in His mercy and love God has called me for Himself, and with His grace I have given myself totally to Him in love and service to His people-the Church. This is a “spiritual marriage” which means I have made a public vow offering my whole being as a spouse of Jesus in chastity, poverty and obedience until death in freedom of spirit and joy in this cloistered contemplative community following the charism and spirit of St. Dominic – all for the glory of God and the salvation of souls. Did your family life have any influence on your vocation? Yes, very much I would say, though I might not have realized it before. The example of prayer and Christian charity I’ve seen from my dear parents and siblings – our poor, simple and ordinary daily living animated by faith and joy, great trust in Divine Providence and a loving devotion to Mama Mary – these have left a deep impression on me. Perhaps no one realized it but I believe that our daily Family Rosary was “a time of sowing the seeds” of religious vocations in our family. For all these I am most grateful to the Good God. As a Dominican, the prayer of the Rosary is an integral part of your life. How is this true for you? the Holy Rosary for me is not just a set of prayers or a devotion as many would naturally think of it. It is a way of life, it is a mission. It is the Gospel. It is the very life of Jesus – the Incarnate Word of God, Jesus-the Truth Whom we praise, bless and preach by word and deed and by our very life of consecration for the salvation of souls. In the Mystical Body of Christ, the Church, what is your particular mission as a Dominican Cloistered Nun? My mission is to LOVE, to PRAY and to SACRIFICE with joy, always in union with and through Mary-in a life of contemplation, by this I share in the holy preaching of the whole Order. By a life of union with Jesus Crucified I help draw graces upon the world and in particular upon our Brethren, that their preaching may be fruitful for the salvation and sanctification of souls- this is the very inspiration why our Holy Father St. Dominic founded the Dominican Nuns. They are to be at the very heart of preaching by their life of loving prayer and penance. If you could speak to the whole human family what would you say? I wish to echo our Blessed Mother’s plea to the Little Shepherds of Fatima and indeed to each of us Her beloved children. Her message is a message of God’s mercy and love for each and every soul. Heaven itself has taught us the remedy for sin and the way to conversion. God sent no less than the august Queen of Heaven and Earth to deliver His message. If such is the Messenger, how important the Message must be. Let us convert and return to Jesus and our loving Abba Father. Let us now do away with sin, with pride and disobedience in its many forms, let us humble ourselves, let us obey, let us forgive, forgive, forgive. Let us not delay, for God wants us to be happy in a life of grace. And you dear brothers and sisters who suffer much- take courage! Jesus Mary and Joseph are very close to you. To suffer with love in union with Them you are helping to save many souls and to sanctify your own… God’s grace and His tender love will always continue to sustain you. Know that we are united with you in constant prayers.You are very precious to God! And to the young people in particular? Ah, young people, You are the apple of God’s eye… You are loved – so much! If I could only convince each and everyone of you how precious you are to God and when you choose to be far from Him by sin how this grieves His Heart. But He continues to seek you out that you may have peace of soul and joy of heart for He alone is true joy and the source of all that is good and what you truly long for. Oh, How He loves you. Go to Jesus in the Blessed Sacrament. Give him your heart. Give God a chance – to transform your life. Those of you who have discovered the sweetness of God’s merciful love and the power of His grace in the Holy Eucharist, rejoice and remain faithful, bring all others to that Fount of redeeming love. Stay very close to Mary – She is God’s Mother and our very own too. Allow Her to accompany you wherever you go, to guide and help you make the right choices each time. She leads you to Jesus. Do not be afraid nor be ashamed to pray the Rosary. It is a most powerful prayer! Consecrate yourselves to the Immaculate Heart of Mary for She has promised: “My Immaculate Heart will be your refuge and the way that will lead you to God”. Yes, you are charged with a “Mission Possible: TO BE HOLY! And with Mary, it is sure, quick and easy! Where do you see the greatest sign of hope in the world today? The Holy Eucharist and the Holy Rosary – here lies our greatest Hope, our only Hope. I believe that God is silently but powerfully renewing the world through the hearts of the humble, simple, child-like and suffering people, the young and the old and especially the children and those pure of heart. These are the ones who count as nothing in the eyes of the world. They continue to be faithful to Jesus in the Holy Eucharist, they continue to pray and live the Holy Rosary in their lives. This is where I see a great sign of hope because like our humble Mary through them God will show forth the splendour of His arm and will reclaim this world and those who truly belong to Himself – in His own good time. Those who live by faith know that God’s powerful instruments are the small and lowly things and people in this world. Would you encourage young women to consider the monastic life today? I have found the “pearl of great price” and how I wish they too may discover such a treasure. I pray fervently that many young women would respond promptly and generously to the call of Him Who is LOVE. There is no greater joy in this world than to belong entirely to Jesus Crucified, to be a chosen instrument of His Divine Love for the salvation of all humanity. In the monastic life, the demands are high and are as great as the whole world we carry daily in our hearts and offer to God, but His grace never fails and His love is what holds us to the end. Yes, when you fall in love with LOVE, it is for life and FOREVER! These opening words of Pope John Paul II’s Apostolic Letter for the Year of the Eucharist draw us immediately into the company of Jesus and the disciples on their way to Emmaus. It was Easter evening, the disciples were sad, alomost without hope when the Divine Stranger joined them on the road. While at table, the Stranger took the bread, blessed it and broke it. At this, St Luke tells us, the disciples recognized the Lord. One of the sweetest fruits of this Year of the Eucharist could be that all of us, members of the Church, with our eyes opened and our hearts burning within us, might more fully recognize the Lord Jesus in our midst everyday, above all in the Holy Eucharist. Pope John Paul II writes in his Letter: “Faith demands that we approach the Eucharist fully aware that we are approaching Christ Himself…The Eucharist is a mystery of Presence, the perfect fulfillment of Jesus’ promise to remain with us until the end of the world.” (N.º 16) St. Luke recounts that, upon recognizing the Lord in the breaking of the bread, the disciples set out immediately to share the news that they had seen the Risen Lord! May this Feast of Christmas be filled with grace, peace and joy for each of you! From members of the Perpetual Rosary Association we received the lovely poem and reflection below. Heartfelt thanks to them and to all of you from all of us! I’ll carry your message to Jesus. I’ll keep the enemy from your door. with Jesus, My Lord, My Creator, My Saviour. every day to help you walk the stairs that lead you to your true home in Heaven for all etenity. we received this inspiring reflection. that you and I ask for. We are happy to say that we continue to receive many new members in the Perpetual Rosary Association. May the Child Jesus live in your hearts!